This BioProvince (as defined by Armen Takhtajan) is poorly defined but includes large parts of the upland zones of the Shillong Plateau including the Jaintia Hills, Khasi Hills, Manipur Mountains, Naga Hills, Patkai Hills and possibly the Mikir Hills. The geology is complex and variable, while the climate is monsoonic with marked seasonal variation in rainfall and temperature. Most of the annual rainfall occurs in summer and mean annual temperatures range from 18-26°C. The BioProvince is part of the Indo-Burma biodiversity hotspot - an area that is important in providing refuge for much of the Tertiary flora of eastern Asia and includes a large number of ancient angiosperms. In fact, the area is considered to possibly represent the cradle of flowering plant evolution. The flora is incredably rich and even within the small state of Meghalaya there is estimated to be over 3000 flowering plants - of these about 1236 are considered to be endemic. Above 900 m most of the flora and most of the endemics are of Holarctic origin. The flora as a whole has a mixed Indomalesian-Eastern Asiatic character. 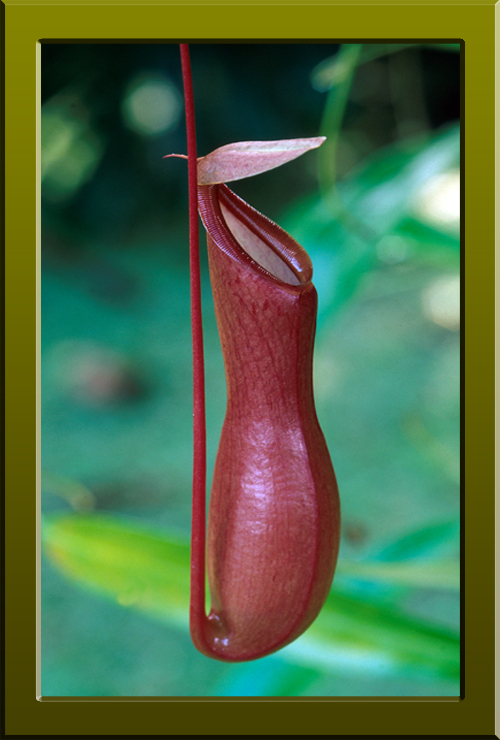 Among the Palaeotropic endemics is the pitcher plant Nepenthes khasiana (see photo below), which here is at the northern limit of the genus. Endemic or near endemic genera include Drimycarpus (Anacardiaceae), Phlogacanthus (Acanthaceae) and Tupidanthus (Araliaceae). Nepenthes khasiana (Nepenthaceae) a rare, endangered pitcher plant that is virtually endemic to the Khasi Hills and the only species of Nepenthes native to India (Copyright © 2010 Peter Martin Rhind).